The tournament already started on wednesday with the womens tournament and the mens qualification tournament. In this years competition we have seven teams. Netherlands and Sweden came with two teams and in addition we have teams from Austria, Germany and and Italy. After the group stage, quarter final and semi final we have a final tomorrow between Netherlands 1 and Germany. We can't wait to see who comes out the stronger team. All the results from the women tournament can be found here. With 15 teams pre qualified for the main tournament there was one more spot up for grabs for the winner of the qualification tournament. This was a high level tournament with a lot of great games. In the end France 2 came out as the winners after a great final against Spain 2. They won 18-11 in a spectacular final. Lucien Alessandri with a shark dink at the net. The group stage had a lot of interesting games and the biggest surprise was probably Germany winning 18-16 over the reigning champions Portugal 1. Mo Obeid and Joel Nißlein came out strong and never looked back - even bringing the usual shark attacks into the mix. Nelson Pereira and Miguel Pinheiro did not expect this level from the Germans and had to settle for second place in group D after Germany. As the winner of the group Germany advance straight to the semi finals and can rest one extra game. Congratulations to Mo and Joel. Another big surprise was the level of consistency we saw from the Swiss footvolley legends Nils Fehr and Benedikt Zwyssig in group A. After loosing their first game to the Austrian first team 18-11, they came back strong to beat Netherlands 18-14 and the Austrian second team 18-5. That secured them a second place in the group and they now face Greece and not Portugal 2 in the quarter final. The brothers Klemens Hofmann-Wellenhof and Jakob Hofmann-Wellenhof representing Austria 1 were unbeatable and came through the group stage victorious. The fans gave them a standing ovation and we expect great things from the local heros in the finals. The strongest group was group C with Spain, France 2, Italy and Norway. France 2 had a tough way to the group stage coming in as the winners of the qualification tournament the day before - playing 5 games. They continue to play better and better, won all their games in the group and clinched the number one spot. France 1 should be afraid of losing the number 1 spot in France. Spain, the bronze medal winners from 2017, showed their skills and secured the second place. 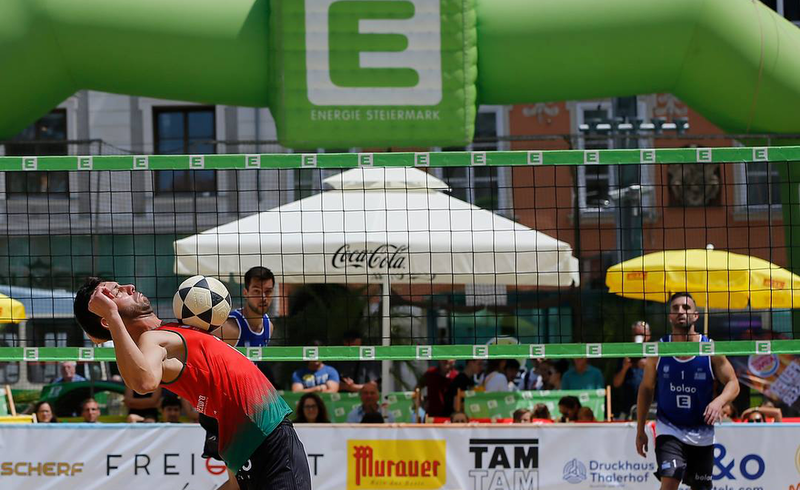 Footvolley is all about fair play and doing your best to win every game. France 1 and Portugal 2 ended up in a situation where they would benefit from not winning the group - due to Germany unexpectedly winning group D. This resulted in at very strange matchup were it seemed most difficult NOT to win the points. The audience went silent and we could hear a pin drop in the arena. In the end France 1 came out as the winners and do not have to play the 1/8 final - but meet reigning champion Portugal 1. Greece once again got through to the final stage and meets Switzerland in the 1/8 final tomorrow.